Imagine there is a witty intelligent blog entry here rather then some random sentence I wrote before going to bed early since I have a horrible headache. I hate to bother you, cause I know you must be SO busy. But are we gonna get new dresses for Florence too? I really like her. She’s one of my favs on the site. Hey, sorry you are not feeling well, and hope you are better soon. I am not sure if it is my end or yours; but I can not seem to find Florence’s PDFs for this week and last. The message says that there is no page listed on site. Your other dolls look like they are all right. Get well soon. Sorry about that Joanna, it should be fixed now. And there should be some new Florence stuff next week. I’ll be switching on and off doing old Florence stuff and new Florence stuff. 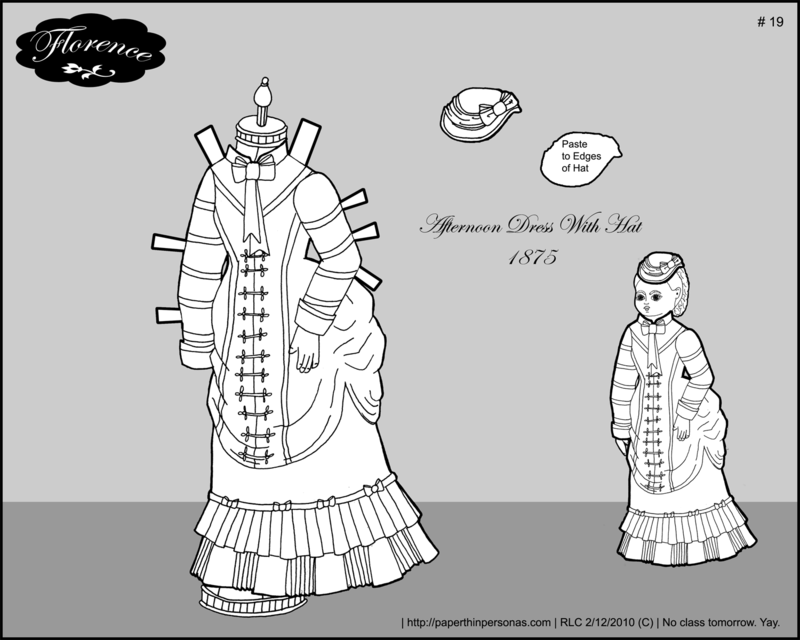 She’s got a winder costume, a spring walking suit and a riding habit all in the works. When I colored this, it ended up looking like something she’d wear for 4th of July. If they had it back then.